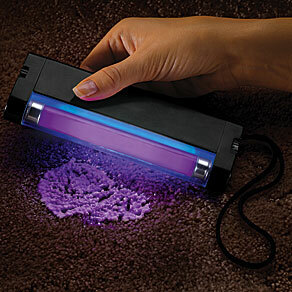 If you're holding a party for New Years' and plan on inviting more than four people, you may want to invest in one of those Stain Detector/Black lights. Not only can you see just where all your revelers have spilled their beer, you can see if any of them got a little frisky on your furniture—specifically, your bed—when you weren't looking. Yes, the joke prop of countless TV shows and movies is available for $6.99. Just scan the light over suspected areas and you'll expose "residue" you couldn't see with your naked eye. Sure beats having to move.